I have a story for you, and it came looking for me. This fuzzy "wuzzy" cardinal landed right on the fence in front of me while I was weeding. His feathers were all fluffy, and stood out. He looked tired and mean. Can you see something green in his beak? I think he must work very hard for it or something. I quickly snapped with all the wrong setting on my camera, of course. He looked at me as if he had a story to tell. He flew slowly away with an enticing behavior to invite me! So I followed him to my front yard by listening to his chirping. He stopped at the prickly bush, still looking back for me, and hopped on the branches. He was about to go deep inside the bush, but changed his mind (typical male) and came back out without giving up his bacon. I have missed the story by your feathered friend. How nice if I can be with him personally, and talk back to him. doesn't look like the camera was in wrong settings, the details are awesome and i can see the food clearly in his beak, the emotions in the eyes, these are awesome photos. love it - he looks really sharp !!! What a beautiful collage you got. It looks like the settings were just right. I haven't seen a cardinal in years. They must not like all the seagulls around here. Loved the story and fun photos! Love that first shot. Poor guy looks like he fought a mighty battle for that bit of food. First, I'm embarrassed to admit I had not followed your blog previously. What the heck? My bad. 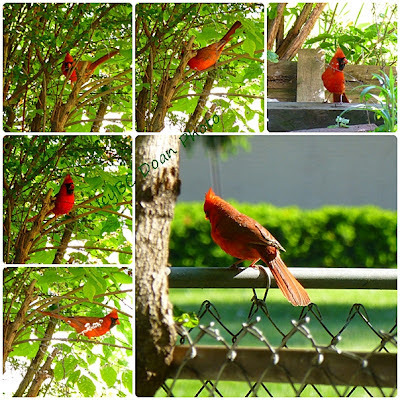 Cardinals in our area are particularly frazzled if left without a mate. I have one that keeps crashing into our picture window. Poor boy. Great shots of the fluffy guy! What a beauty! So glad you spotted him!